i will never get tired of seeing Mikey whether a drawing or on film. I grew up just like he is. according to my family that is. 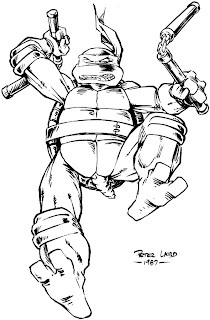 I think this may be by far one of the best drawings of Michelangelo I've ever seen. I love that style of turtles, very good pic. -->> O.T.-on :: THAT TMNT 30 BOOK ROCKS !! THE STORY WAS KILLER !! !! And Mike's role steals it !! I love the Ton's so much here !! !! i don't know how to say that. or is the ' s ' silent ?! Mike's my favorite. That's just such a classic pose and picture there.